Rapt.fm is a startup based in Detroit, and has created a split-screen Web platform that allows users to engage in freestyle rap battles as Internet audiences watch, chat, and vote for who they like best. Tomorrow, Rapt kicks off its beta launch, having addressed past technical glitches, says Rapt’s co-founder Erik Torenberg. During the site’s alpha testing period, which lasted most of the summer, the site was open Mondays and Wednesdays from 9 p.m. to 12 a.m. Torenberg says he started seeing serious traction in July, when Rapt racked up 7,000 users, with one session alone attracting a crowd of 1,000. Torenberg saw lots of returning users, with the average user spending 25 minutes on the site. Rapt has signed a deal with Tommy Boy Entertainment, a classic hip-hop imprint perhaps most famously associated with the early releases of De La Soul, Afrika Bambaataa, and Queen Latifah. Today, like many record labels, their artist roster focuses on electronic dance music. The deal with Tommy Boy involves a micro record contract. A contest will be held on Rapt and the winner will get a distribution deal for his or her winning single. “If the single does well, I’m sure it can lead to further negotiations,” Torenberg notes. A number of rappers are partnering with Rapt for tomorrow’s launch and will be on site, including Jarobi White from A Tribe Called Quest, Big Pooh from the beloved group Little Brother, Soul Khan, and Dres from Black Sheep. The launch will begin at 9 p.m.
Torenberg says his guest rappers will probably trade verses among themselves and preview work from upcoming tracks, but there is always the possibility that they will engage in some battle rapping with an audience member. During the summer, Rapt held a contest online to find opening acts for Detroit’s Royce da 5’9” and Bone Thugs-N-Harmony, when they played in Detroit as part of the Oaklaoosa Festival. An artist from Detroit called CrackKillz and New York City’s Deshawn Supreme won the honors. 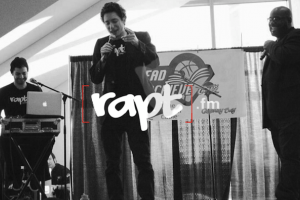 Although Rapt is designed to be an easily accessible platform where anyone can try to engage in a rap battle, no matter how dorky or arrhythmic they may be, Torenberg is definitely eager to nurture the role Rapt can play in the careers of budding artists. “I’m interested in artist discovery—finding them literally in their basement,” he adds. Torenberg hopes traction from the beta launch, along with the improved tech platform, will help the company collect $500,000 in seed funding. He says the company will begin fundraising soon.